I would like to begin with a contemporary of you, Greta Thunberg, from Sweden. Last summer she began a strike for a better climate. She has become a paragon of the world-wide climate protest. Let us first watch her speak at at UN Climate Change COP24 Conference (YouTube). has one, inconvenient message (Ezekiel 2, 9 and 7,5-7 and so on). All these things are also said about Greta Thunberg (based on an article in the Dutch Newspaper NRC Handelsblad, February 1st, 2019). Her message is inconvenient: we must act now not to be late. I do not know whether Thunberg is a believer or not. Those how know the Bible understand that the Holy Spirit is free to use whom he chooses. It is not about the person (of the prophet/prophetess) but about listening and obeying. In this case about the care of God’s creation. Does God speak through climate-protests and its representatives? This is an important question for the faithful. I think all this is so, indeed. How then en what? This is what this sermon is about. 2 Whose fault is it; who to blame? This complaint articulates a feeling people sometimes have. You may recognize it. Or just a bit of it. Or totally. Problems accumulate. You have a feeling as if ‘all the world’ is against you. Or an assumed impossible task lies before you. You feel victim of the situation. Ezekiel prophesies that things are different. He gives an example about three generations. A father, a son and a grandson (18,5-19). In each case the subject is how they live individually. This happens on the basis of four aspect of life: religion, marriage and sexuality, the social-economic society and law (honesty). The entire life is covered. God does not want just a part of it. He is Lord over everything. The refrain of all these passages is: He who lives honestly, is treated honestly and he who lives in the wrong way will be punished (18,20). God judges everybody separately. The complaint of God’s people that God is dishonest/unfair (18,25 and 29) or that you are chained to your parents’ guilt is unfounded and unjust. Ezekiel adds something important (18,21-31). The chapter closes with a call-up to conversion! Opposite the fatalistic sense of life, God lodges an appeal for responsibility. God wants a man to be sorry for wrongs things. That he converts himself. Starts to live justly. That he does not make a little sum of what is still only just right or on the brink of wrong (18,24). Forgiveness after repentance is something wonderful. It unchains you from what you did wrong in the past (18,22). God even allows people to look inside his own heart. God says that judgement to death does not please him, but that conversion and living does (18,23). What a splendid passage this is. Here, in the centre of the Old Testament, Jesus’ Gospel sounds in full. Acquaintance for he who returns to him with repentance about his sins, the promise of new life through the power is his Spirit and the call to live such a life (Ephesians 2,1-10). 3 Ezekiel and the climate issue. How do we read this Bible part when dealing with climate issues? The example of the generations is recognizable. Present-day youngsters go into the streets. They are called climate truants. Sometimes the protest sounds that previous generations have spoilt everything (compare Ezekiel 18,2). 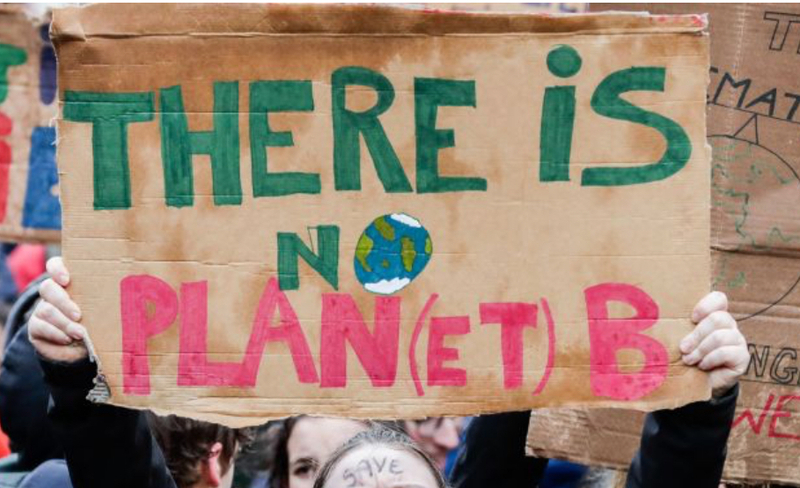 Others mockingly turn this around and tell youngsters: do you really care about the issue of do you just want to play truant for a day; what is your contribution to the climate problems? Before you realise we are stuck in the same circle that Ezekiel describes so strikingly. It is not my fault, is it? How can I help this? The Bible tells, not only in the book of Ezekiel, that we are responsible people. This is how God created us. In church, therefore, we want to learn to behave accordingly. This is far from easy. Christians sometimes have the same fatalistic attitude as the believers in Ezekiel 18. The say (or think): God takes care of his creation, does not he? Or they care little because God has promised a new heaven and earth (Revelation 21). Have believers stressed too much the souls that have to be saved? But, then. Read carefully. Exactly the same word (nefeš) can be found here in Ezekiel 18,4: “all people’s lives (souls) belong to me.” This is about the entire life (Ezekiel 18,5-19). This is how the Bible always speaks. Ezekiel points out already that God is entire/holistic. God’s judgement about his people, for example, is not only about people but also about the country the live in (Ezekiel 15,8). Psalm 24 says that all the earth and all that lives is God’s. Jesus himself says, after his resurrection. That the good news is meant for the entire creation (Mark 16,15). This is why climate issues and good carte for this creation are so extremely important. And it is equally important to speak about them in the right way. This afternoon we do not start with action x or y. Ezekiel 18 makes you do something else first. We are placed in front of God. We just song the so-called climate song. In it we confess our shortcomings and guilt. Oùr guilt (Ezekiel 33,10!). The climate song also sings about those fields of life that are indicated by Ezekiel (18,5-19). Our greed, for example. An economy of more and more. Within a few decades we have exhausted the earth and suppressed the less fortunate. Kyrie Eleison , Lord, have mercy, we sing. We are nor positioned above the believers of Ezekiel’s days. We have dirty hands and hearts. We look up and expect Jesus. Golgotha is God’s ‘climate protest’. In the middle of the day darkness fell (Matthew 27,45). The creation did not want to have anything to do with Jesus. Jesus the guilty (Ezekiel 18). But by way of his death and resurrection Jesus won. Jesus will set everything right. He will renew the entire creation and cosmos. Trust in hem makes room to live today. It is a call up to convert again and again. Handle God’s creation well an even better. Those who listen well to Ezekiel 18, discover something special. Something that also makes you think when climate problems are at stake. God’s people receive the order to renew their hearts (18,31). This call up is the echo of God’s promise that he would give a new heart (11,19). It is the same thing as in the call to convert and to live (18,32). This call is an echo of God’s electing love for his people (chapter 15 en 16,6 live!). In other words: God gives life so that we can live and gives the life we can live; He determines the framework within which we are responsible. There is a great difference with the situation today. When dealing with climate issues we say that man must finally accept responsibility. We live in the Anthropocene, do not we? We must work forward, be forward-looking. God is entirely outside the discussion because we had already abolished God in our culture. I saw a protest board stating this fine: there is no Plan(et) B. This is a well known and seen poster at climate protest. And yes; it is proper to underline the willingness to take action. But this feeling of urgency can be so strong that something religious can creep into the climate discussions. We save the world. We save it. Do this and do not do that (commandments). Exactly; let us take our responsibility. But, now look back again. How ambitiously the ‘economy of the more’ started. Things would get better for everybody. Wealth for everybody. Happiness and world-wide peace. And now we see the dark sides. What will be the next thing we start with energetically and will break off at the hands? Religion can also be settled in the hearts of believers (Ezekiel 8). It is important to discern. Ezekiel 18 helps us to do so. Life is God’s life (18,4). Thanks to Jesus we are his. God had already prepared Plan(et) B when man sinned for the first time (Genesis 3,15). Ezekiel has already seen something of God’s new world (Ezekiel 40-48). And today this is the same. Not because of us, but because of God’s fidelity. Fortunately so. We honour the Creator. We thank the Redeemer. Allow yourself to be filled with the Spirit. Handle hiss creation well. Pray for Jesus return. Pray that everybody in any given position may take his/her responsibility. We pray for innovative sustainability. Be renewed. In your thinking. In your consuming and abstaining. In your care for God’s creation. This entry was posted in Bijbelstudies, English, Preken and tagged climate-change and faith, God and climate-protests, Thunberg prophet Ezekiel by Matthijs Haak. Bookmark the permalink.